On a week long kayaking trip along the Na Pali coast of Kaua'i I had the chance to watch Derek do something I never saw him do before. When we were off of the water I saw him take out a sketch pad and proceed to capture some beautiful Hawaiian landscapes. I never thought much about Derek's artistic ability but it makes sense he would have such a talent. 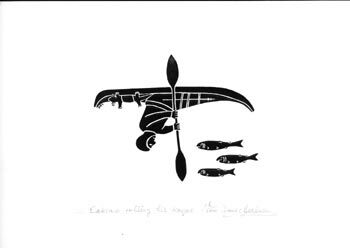 One look at his kayak designs and the pictures he draws for the bows of his kayaks should be the first clue he is a talented man. Among his many jobs Derek taught in the public school system. He taught industrial arts classes (what we would call shop classes in the US.) Derek was trained in industrial design. He even makes his own jewelry. When you meet him take a good look at the ring and medallion (Viking design) he always has on. Derek made these with his own hands. A number of years ago Derek created some "Limited Edition Prints." Some of these designs have found their way into Derek's books. Below are five prints from Derek's personal collection that he is now making available to the public exclusively through USK. If you wish to purchase one or all of the set visit the USK Store to Artwork and Books. Each one of these "Limited Edition Prints" is individually titled, numbered and signed by Derek. The prints are 8.25 X 11.75 inches. 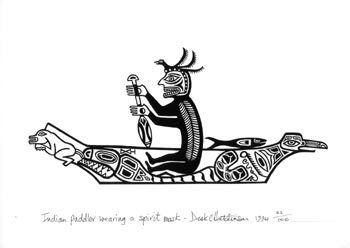 "Indian paddler wearing a spirit mask"
This is Derek's rendition of a native paddling a dugout canoe honoring traditional NW design and folklore. In appreciating the difficulties and challenges the natives endured Derek captures the true essence of living off of the land and sea. 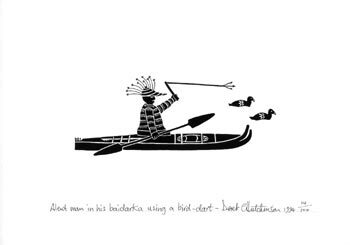 "Aleut man in his Baidarka using a bird-dart"
Derek has this Aleut kayaker in full plumage in his Baidarka using a traditional bird-dart with throwing stick. Here is a fish eye view of an Eskimo contemplating life before rolling up. I wonder how often Derek was in similar contemplation. 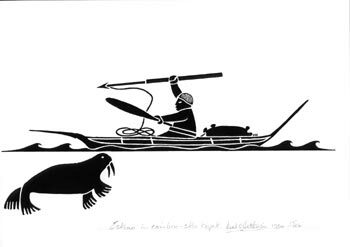 "Aleut whale hunters using poison darts"
Who will survive? 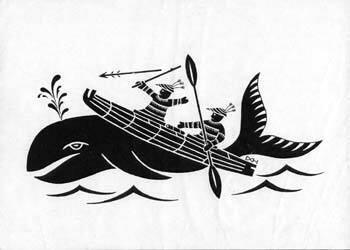 The Aleuts in their two-man Baidarka facing capsize or the whale. Derek's experience on the water has shown him there are no guarantees. Use of these prints and/or designs, without the express permission from the artist, is strictly prohibited. USK thanks Derek for allowing us to show copies of these prints on our web site.